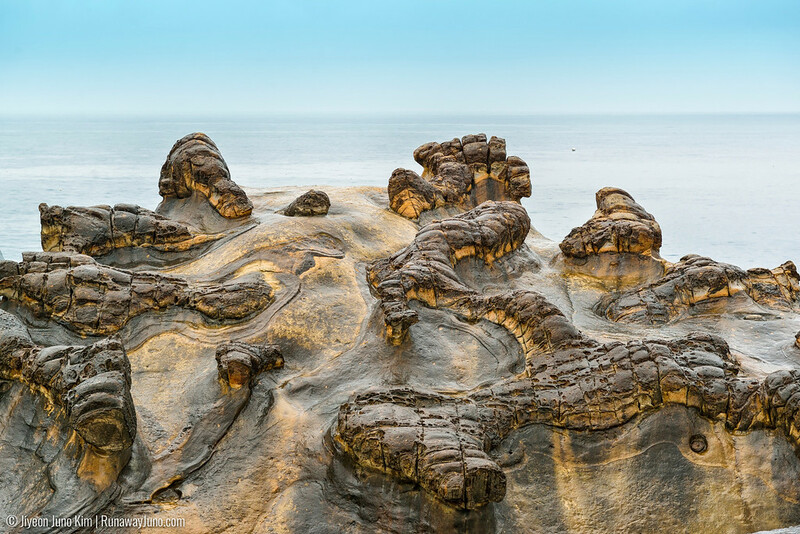 Looking like a brush stroke of a Chinese calligraphy, an island of Taiwan is packed with interesting geological features. That’s the reason how we could soak in the mineral-rich hot springs anywhere in the country. The coastlines look dramatic, like you’re in the middle of an deserted island. 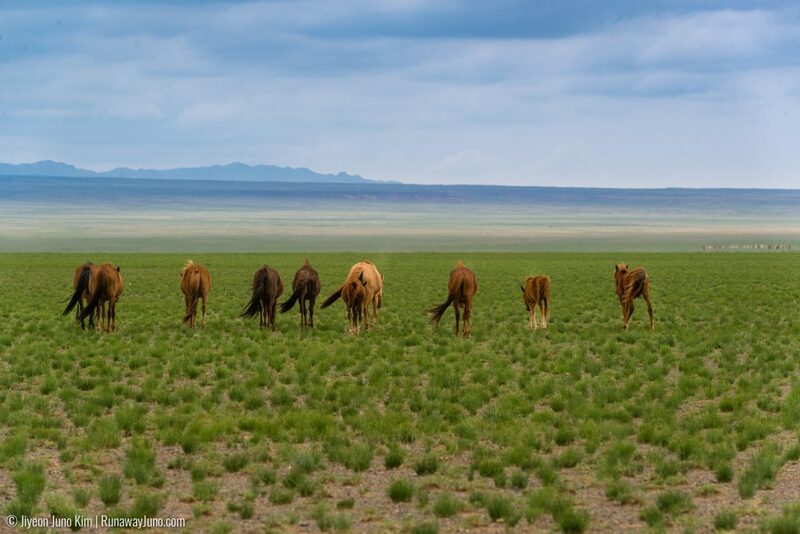 The landscapes here are not the typical image of Asia, in a good way. 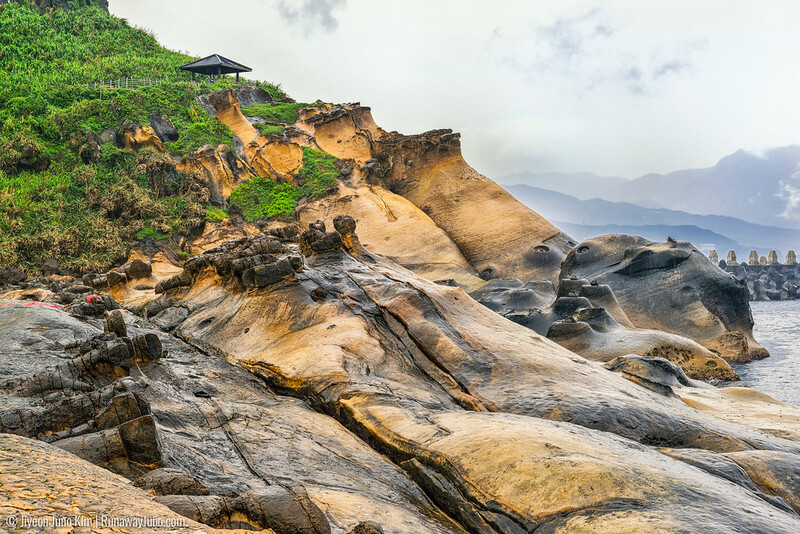 Yehliu Geopark has The Queen’s Head, which is the centerpiece of Taiwan’s northeastern shore. 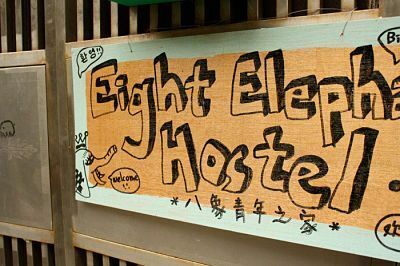 I’ve always wanted to visit this place ever since my short travel to Taipei six years ago. I didn’t pursue my plan because it rained cats and dogs, and surprise surprise, it rained again six years later. But that didn’t stop us. I came back for this, after all this time, and I was going to do it, no matter what. 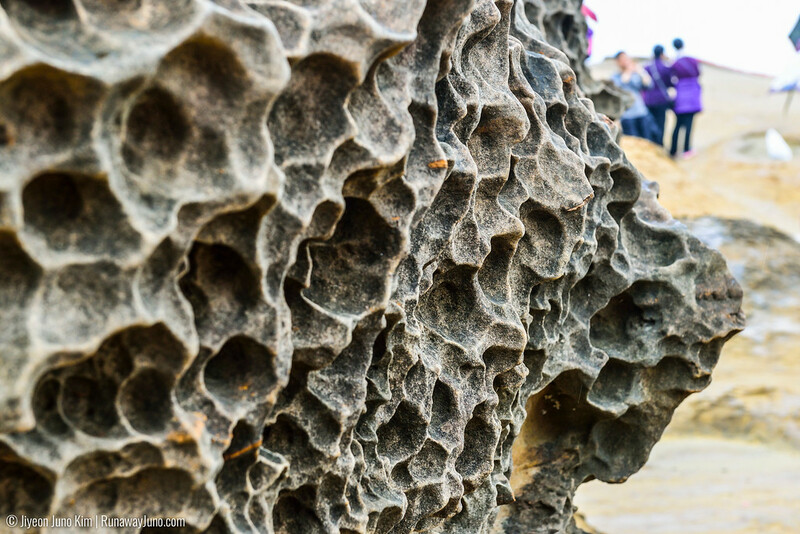 The Queen’s Head (女王頭) is so famous it seems like she is the only attraction, but the park is actually a small peninsula, 1.7km long, and 300m wide filled with interesting sites. 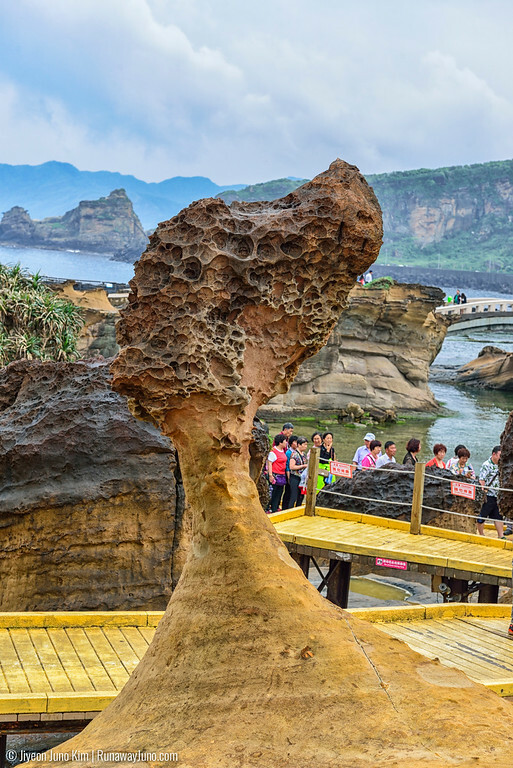 As you can imagine from the name, Yehliu Geopark, this is where you can see many kinds of rock formations and geological features. 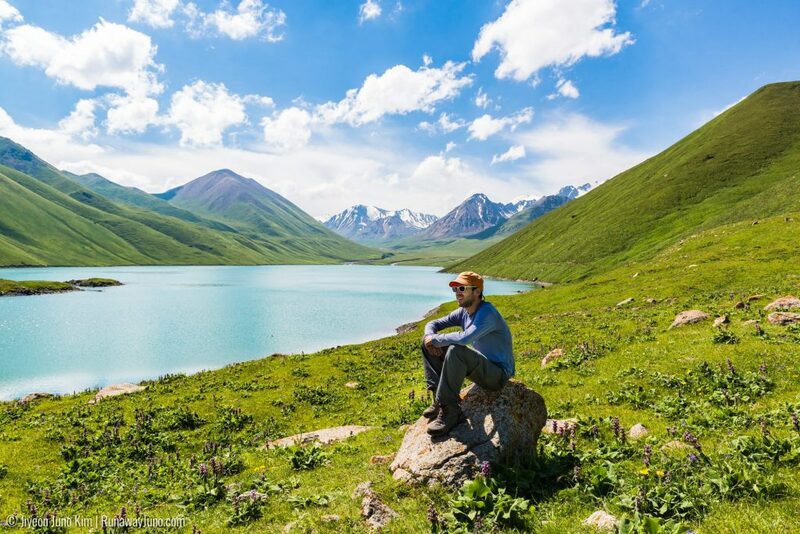 Erosion from wave, rock weathering, earth movement and crustal movement all contribute to the formation of such a rare and stunning geological landscape. 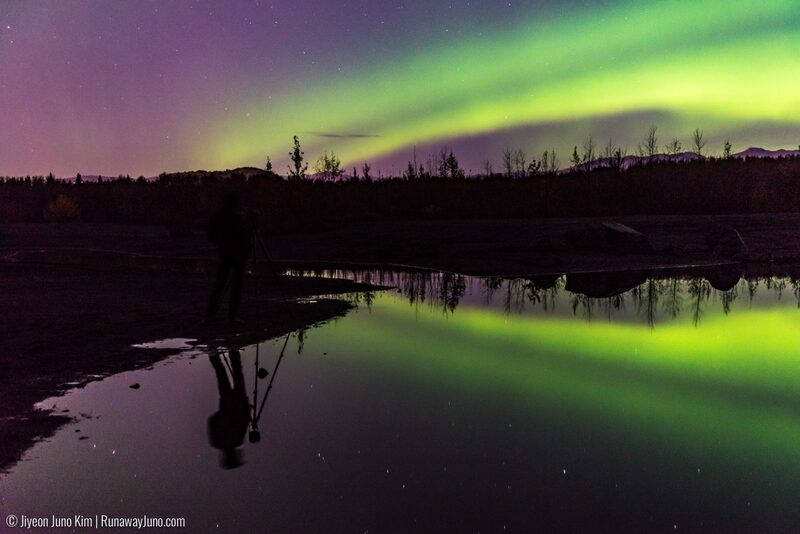 Seeing what nature can do; it amazes me every single time. 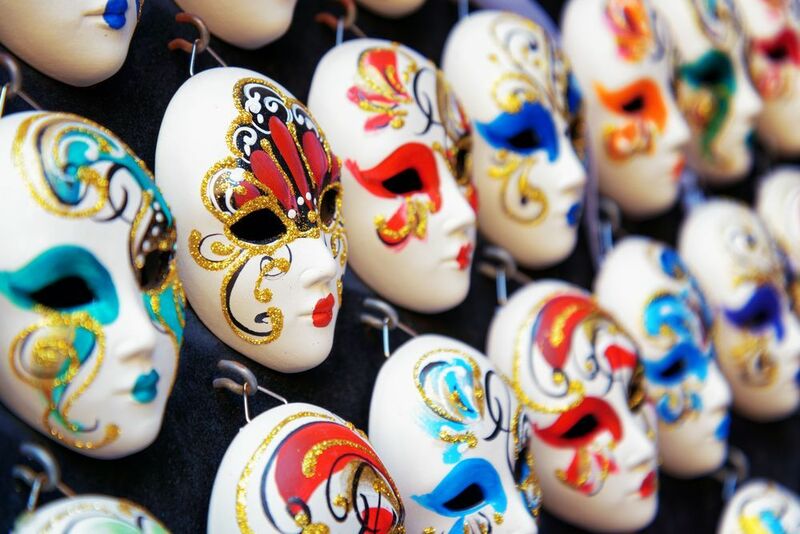 It is one of the most popular attractions in Taiwan, so be prepared to mingle with the crowds. The park is just about the right size. It’s big enough for a half day excursion, and small enough to walk around. There are replicas of The Queen’s Head near the entrance of the par, but ignore them for the real deal. 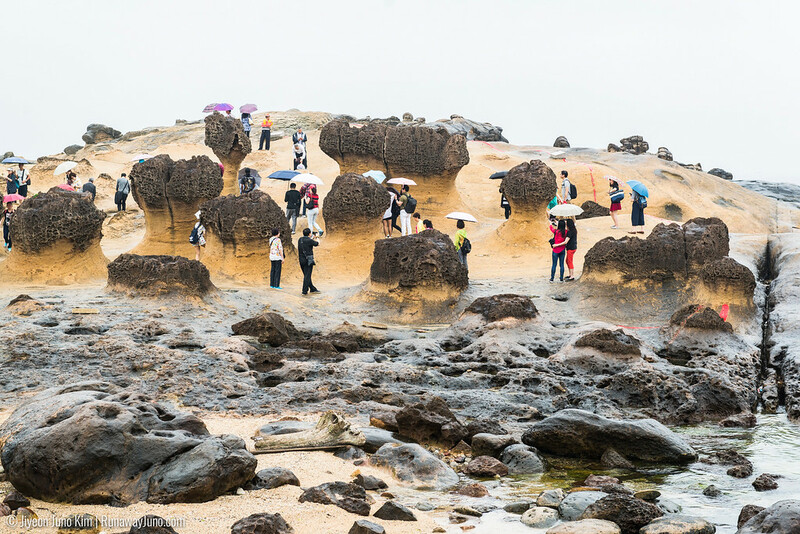 Yehliu Geopark can be divided into three parts. 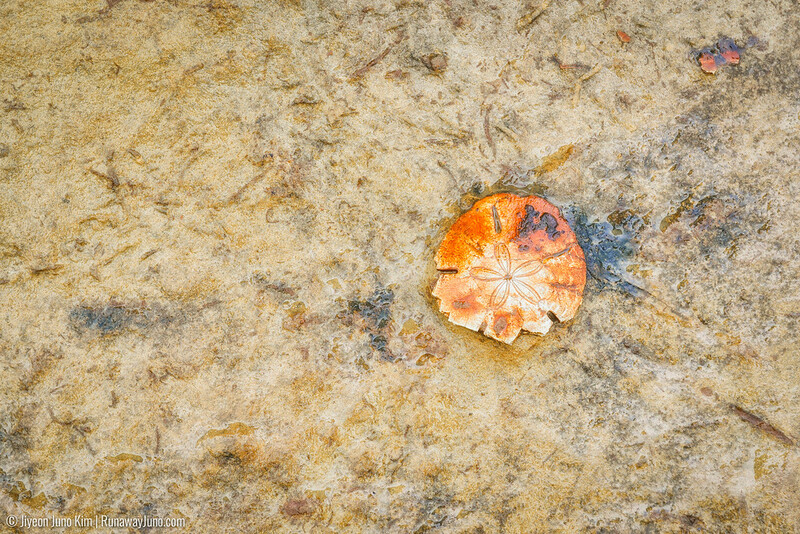 The first area contains Muhroom Rock. It does look like a field of young mushroom buds coming out of the ground. 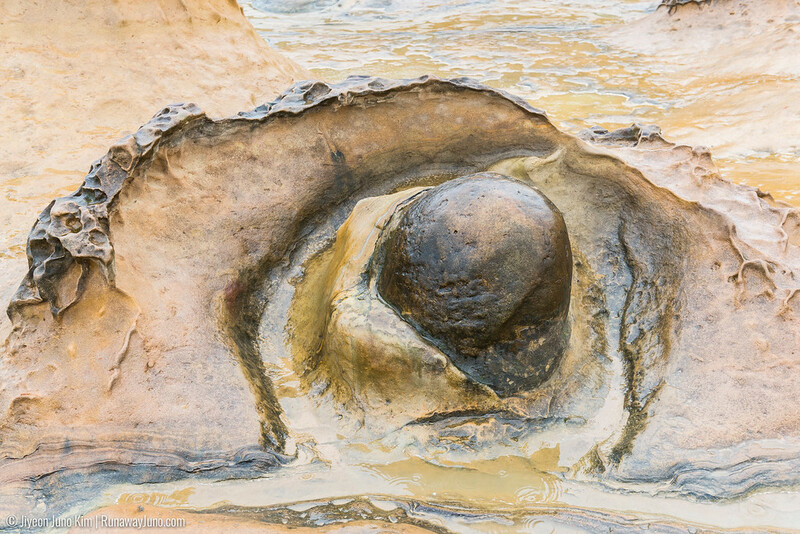 Up close, you can witness the development process of mushroom rock, as well as witness the appearance of ginger rock, pothole and melting erosion panel. Here you can see the famous candle rock and ice cream rock. I especially liked the Ginger Rock. 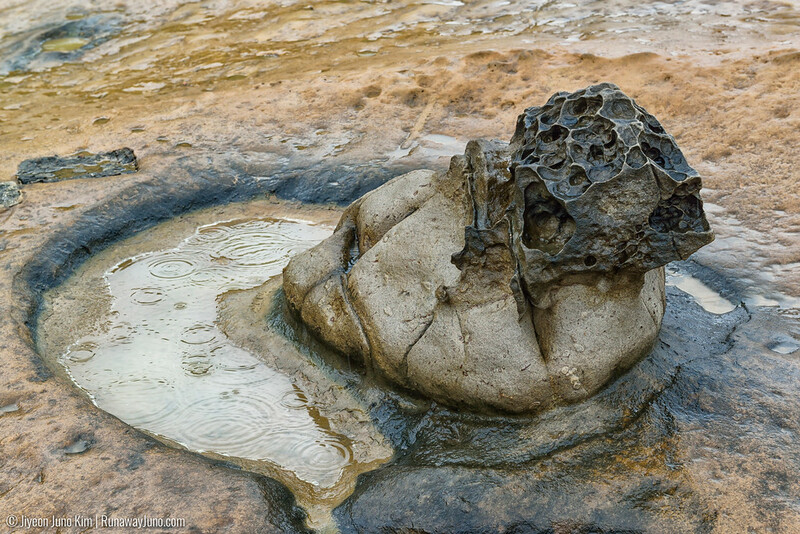 It’s created because the rock layer contains irregular concretions within, the harder concretions rose above the ground while the softer ones descended downward as erosion imposes upon the rock. The second area is the main stage; The Queen resides here. It is definitely the most popular area of the park; you have to line up to take the 1:1 photo with The Queen’s Head. 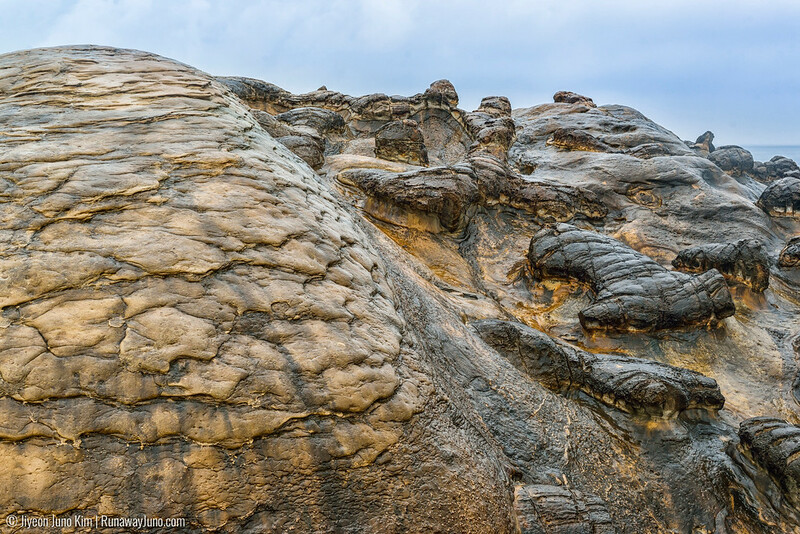 There are many well-named rocks in this area, including fairy’s shoe and elephant rock. The third area is where you can see the dramatic sea erosion. The ecology reserve of the park is also here. 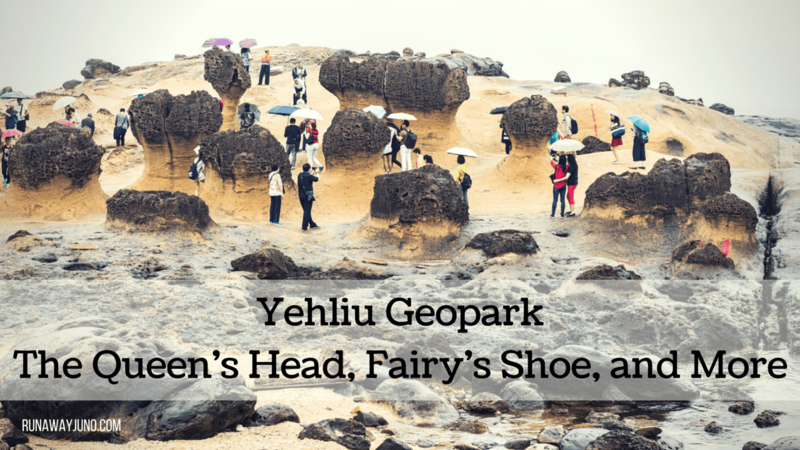 Yehliu Geopark reminded me of the Giant’s Causeway because both have amazing geological features by the coast. But the actual landscape cannot be more different. Despite the rain we had a great day walking among these rock formations. My rain jacket got wet inside out, the sky was gray, we walked with waves of crowds, but it was good to finally see the park and The Queen’s Head. Can you imagine the kind of things these rocks have witnessed? The landscape here is literally ever changing. We would never know the difference in our lifetime but our children and their children will see a bit different view when they come. There might not be The Queen’s Head anymore. I think her head is too big for her neck, to be honest (sorry!). So please remember not to ‘bother’ the rocks. Touching, climbing, writing, all are big no-no. Don’t cross the red line. Be respectful for their lives. The red lines are also there to protect you from falling into the sea. 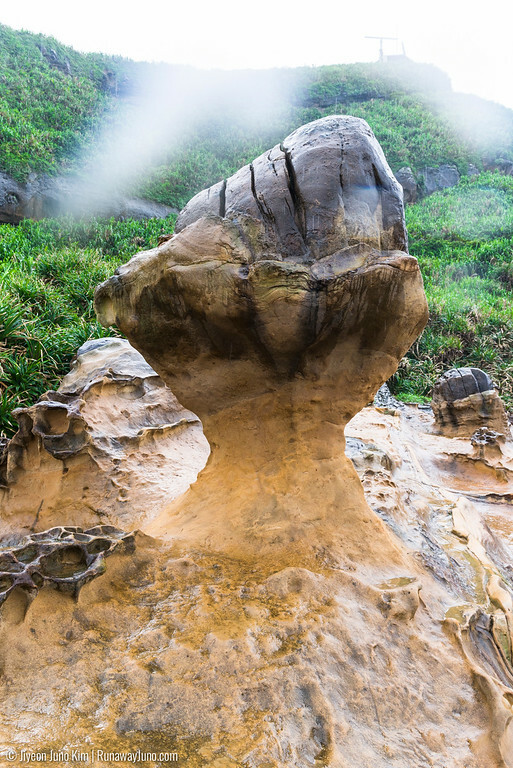 Getting to the Geopark from Taipei is easy; although a lot of visitors stay overnight at Keelung City, which is near the park. Take bus 1815 from West Bus Station Terminal A (near Taipei Main Station) bound for “Jin Shan Youth Activity Centre” route (the bus also stops at City Hall, ZhongXiaoFuXing MRT stations). The trip takes about 1-1.5hr, passing through Keelung City. The roads wind up and down of hills as soon as we got out of the city limit. If you’re venerable to motion sickness, be aware. 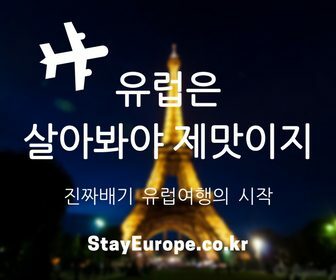 Get off at “Yehliu”. From the main road, walk about 15 minute to the entrance. The road to the park is hard to miss; but if you are still not sure, just follow the rows and rows of big tour buses. The first bus departs at 5:40AM (weekdays) and 6:15AM (weekends). Bus frequency: 15~20 mins. Fare: NT$96 (Can use Easycard). 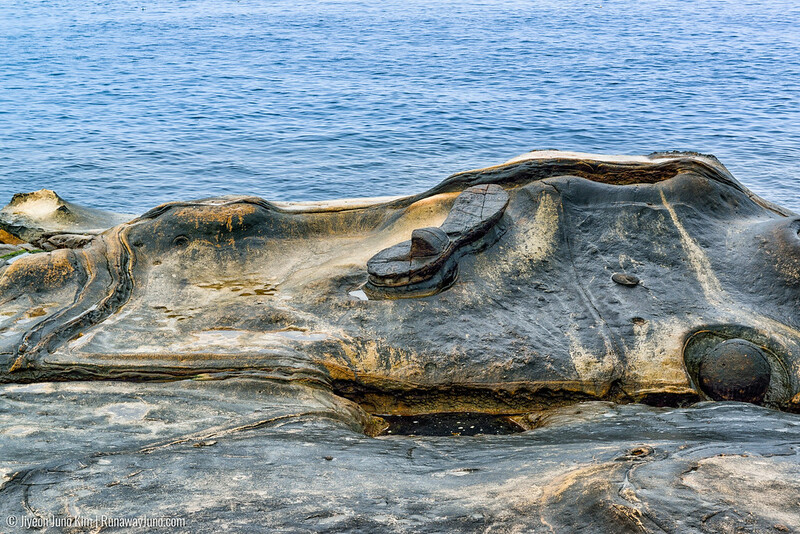 its amazing what the force of sea on rocks creates! Beautiful! 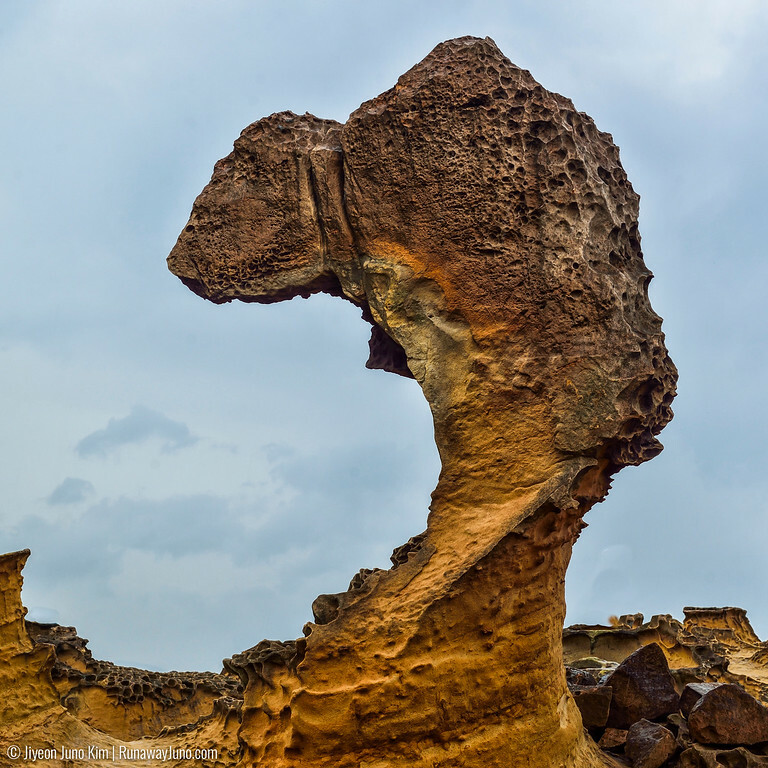 What amazing rock formations … Taiwan is coming up next to my travels; when I get there, I’ll be sure to check out this park. thanks for tipping me off to it!